First and second phases of Cubism. 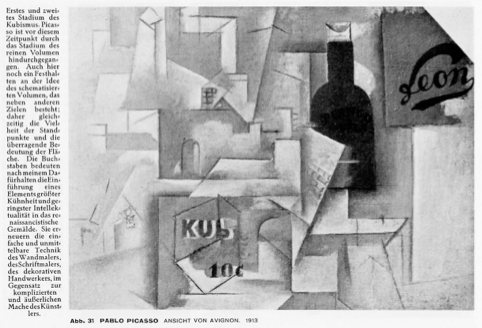 Picasso has already passed through the phase of pure volume. Here, too, an adhesion to the idea of volume shown in a schematic fashion is still present alongside other aims. So, at one and the same time, we have a multiplicity of viewpoints and an overwhelming predominance given to the plane surface. The letters, as I understand them, introduce an element of the greatest boldness with regard to the Renaissance type of painting. They are not there for any purely intellectual reason. They renew with the technique, simple and immediate, of the mural painter, the sign-painter, the decorative craftsman, as opposed to the complicated and superficial ostentation of the artist. 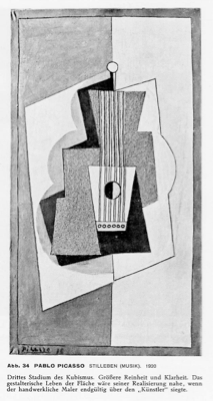 Second phase of Cubism which, in this example, appears with greater purity. The volume has disappeared entirely. The descriptive element is reduced to a rough sketch of a number of geometrical extensions. The directions chosen by the painter for the different elements which constitute the picture follow those orientations which are natural to the surface. The technique of the mural painter is enforced more and more through the more and more radical dissolution of the subject. It is a mural painting, and it has the uniqueness and permanence which are particularly characteristic of this medium as opposed to easel painting. It is a medium whose principles are not affected even when the conventional idea of the description has made such an astonishing plunge into the world of private metaphysics. It in the borrowings from the discipline of a craft, in what is characteristic of the workshop, in what is offensive to the respectability of the artistic painting, that the boldness of this painting is to be found, and not in the obscurity by which the anecdote, the subject, has been expressed. Third phase of Cubism. The plastic credibility, the verticality, of the surface, appear here with even greater force. The plastic work, throughout, is simpler, purer, more powerful in its expression. 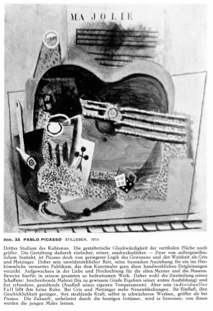 Picasso is certainly a man of unusual instinct, but he is considerably less rigorous with regard both to his conscience and to his intelligence than either Gris or Metzinger. It is this that gives him his charm, which has proved to be irresistable, the particular attraction he holds for a public who are infatuated with whatever is conventional and who are willing to forgive him his excursions into the uncouth world of the craftsman so long as he remains, first and foremost, an artist. Picasso was brought up in a spirit of love and reverence for the old masters and for the museums, and the proof of this can be seen in all his work. Hence the dichotomy there is between a descriptive painting - the product, up to a certain point, of his initial training - and work which is entirely inventive, entirely creative - the product of his own temperament. But there is nothing in his individual style which can be relied upon. Gris and Metzinger have contributed more in the way of discoveries. Their influence, their success, has been less than that of Picasso, but their radiant power - even in their weaker moments - is greater. The future, free of the errors of the present time, will be the proof. It is from those two painters that the young painters will find that they have most to learn. 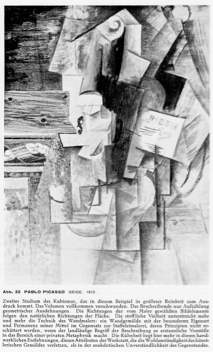 Third phase of Cubism. The surface would be close to realising its own plastic life, if only the craftsman-painter could, once and for all, get the better of the artist.